Your body stores fat at different parts so you must target different major muscles groups in order to burn fat and lose weight. The best way to lose weight is by replacing fatty tissue with lean muscle. Turn your body into a “FAT BURNING MACHINE” . You will be able to burn tons of calories and utilizing stored fat from the upper body, midsection, and lower body with this workout routine. Compound exercises that work many muscle groups at the same time are “more effective than isolation exercises at burning fat,” says Len Kravitz, Ph.D., coordinator of exercise science at the University of New Mexico. 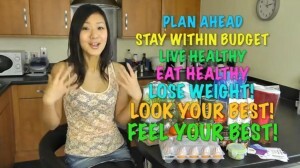 In the following video Joanna Soh will demonstrate a total body workouts to burn fat and lose weight quick. It’s going to be focusing a lot on your legs because that’s the largest part of your body, your chest, biceps, triceps, shoulder as well as you back. By increasing your heart rate you will burn more calories. The routine will use only your bodyweight but make no mistake they are just as effective as working out in the gym. Whether it be working out in a gym or at-home, both share a same key to success. The routine consist of 10 exercises, 1 minute each 40 seconds workout, 20 second rest. Perform all 10 exercise back to back. Rest for 1 minute and repeat. Do 4 circuits in total. Total workout time is 44 minutes. Joanna recommends this exercise to be perform 3 days weekly for 4 weeks together with 3 days of 30-45 minute cardio intervals such as swimming, jogging for best results. Estimate Cals burn is between 350 – 450 Cals. The heavier you are, the more you burn. Breath in and out as you do the jumping jacks and find the rhythm to your breathing and it’ll make your workout easier. Note: Rotator cuff injuries have been reported from consistently doing jumping jacks over time. To avoid injury you may also perform “half-jacks”, these are done the same way, except you only bring your arms parallel to your shoulders and back down. Hands shoulder width apart. Go all the way down and push up with your chest. Keep your core tight and back straight. Do as many as you can in 40 seconds and as you progress you will be able to do more reps (this applies to all the exercises in this routine). I need help with the motivation to lose weight. I just cannot stay motivated! So need to lose the weight gain after cancer steroids ! !